One of my most-searched and viewed recipes! Perfect for the day after St. Patrick’s Day. I first made a version of this soup when I did the 3-Day Detox (free!) from Hungry for Change in January. Completing that detox convinced me that detox programs really do work; this one completely eliminated all my cravings for the naughty foods in which I had over-indulged during the holiday season. Three days was enough to eliminate my cravings, and not too long that I was excessively cranky. I have created my own detox recipe book, Twelve Terrific Detox Recipes, which is available on Amazon. If you love soups like this, try my Italian vegetable detox soup recipe too. The original recipe is based on one from physician Henry Bieler (Bieler’s Broth). According to Hungry for Change, “This vegetable tonic provides an ideal combination for restoring acidâ€“-alkaline and sodiumâ€“potassium balance to the body’s organs and glands.” I can attest that I feel much better than I had all last year. Since the detox I have stuck to a very similar eating plan, with lots of green juices, smoothies, and raw foods. Any time I feel like I might be slipping back into naughty choices, I do a day or two of the detox plan and I’m back on track. While this is not the prettiest soup I’ve ever made, it’s one of my most popular recipes, searched every single day. And it’s really delicious! 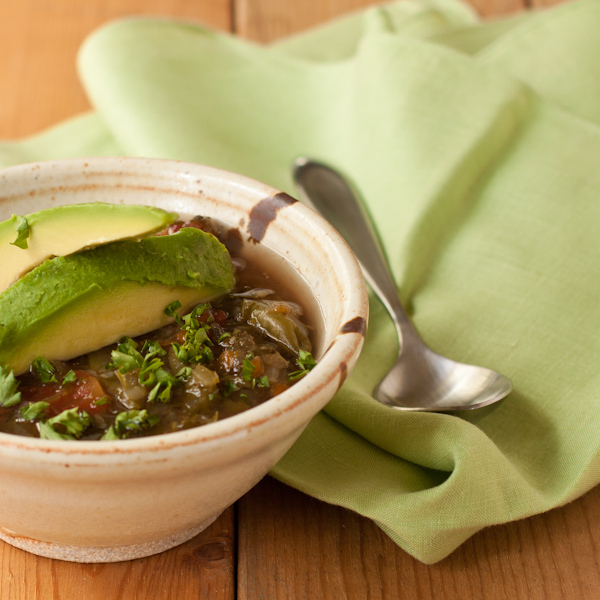 Delicious potassium-balancing detox veggie soup. So easy! Wash the veggies (zucchini through garlic) and then pulse each through the food processor until it's finely chopped. Be sure to include the kale stems; they contain all the potassium in the kale. Reserve a little parsley for garnishing, if desired. As you go, add each veggie to a large, heavy-bottomed stock pot. Add 4 C. (1 L) spring or filtered water. Add the tamari or Bragg's, seaweed, and the teff or amaranth seeds, if using. Bring to a gentle boil, then lower the heat, cover, and let simmer gently for 30 minutes. Serve warm, topped with the reserved parsley and the optional avocado slices. Store covered in the fridge for use within one week, or freeze for extended storage. If you can get home-grown or farmer's market tomatoes, by all means use those. At this time of year in the U.S. they are not available, so I use organic canned tomatoes with no salt added, in a BPA-free can. The seaweed is optional but adds additional vitamins and minerals. The teff or amaranth seeds thicken the soup and add a little protein. Cilantro is incredibly cleansing, but it can overwhelm the soup. Use as much as you prefer. 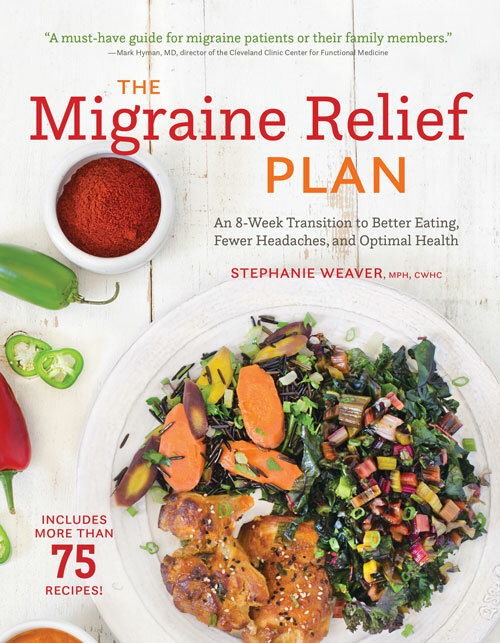 I’m reading the book and I thought avocados were on the avoid list for migraines. I have a similar question about the maple-sesame chicken. I thought maple syrup and no more than a half tsp of white vinegar per recipe. Hi Kell, thank you so much for pointing this out! I updated the recipe to indicate that avocado is not included on the Plan. About the maple-sesame glazed chicken, I do note that certain recipes I use a small amount of particular sugars in order to achieve a taste goal, in this case to replicate teriyaki as much as possible. You can absolutely use less white vinegar in this recipe if you are concerned about it… that’s why the Plan is so adaptable. Much of it cooks off during the cooking process. I hate throwing out anything edible and those stems also add a bite and texture to the soup. I will be making this today, but plan to add some thyme. It helps ward off colds in the winter as well. Thanks for posting. Yes, I hate throwing out food too! Plus the stems are so nutritious and full of potassium. As someone who watches her sodium, I am always looking for high-potassium foods to include in my diet. Will this work as a raw sop? Autumn, you could try it, I’m not sure how it would work. Maybe use a Vitamix and blend it all until warm? I love soup and would love to detox my system, it needs it in a BAD way! I am not familiar with seaweed flakes or nori – can you find them in the regular grocery store? Hi Linda, you can get seaweed flakes in natural foods stores like Whole Foods or similar store, order them online, or find them at an Asian market if you have one in your area. Thanks for visiting from Pinterest! I’ve never heard of a detox soup, that is brilliant! A detox program seems so much more cosy when there is a warm and hearty soup involved. Cant wait to try this, thanks!! You are so welcome. I’m glad I decided to share it (even though the original idea wasn’t mine) because it’s gotten a great response. Let me know if you try it. Stephanie, Thanks. I am going to try this. When you were doing the detox, what else did you have to eat? I should check out the website you mentioned, correct? Thanks. I need a way of (1) losing weight (2) feeling better (3) fighting fatigue (MS) and perhaps this could be a starting point…..
Steph, where did you find amaranth seeds? I hear amaranth also makes a good breakfast cereal, but I haven’t been able to find it. The soup looks great! Pretty sure I got them in the bulk section at People’s Co-op in Ocean Beach, but you’d need to get them in a sealed bag to make sure they aren’t cross-contaminated, since you are celiac. I know that Bob’s Red Mill sells it.